Portal 2 was a fantastic game. Let me say that right off the bat. However, I'm only giving it fourth place. Ordinarily, that would mean that this was a fantastic year for games. Unfortunately, I only played four games this year that were worth giving a place on this list, so that's not true. It just means that there were more games this year that fit my play style. Doesn't it look so clean and sterile? So, Portal 2 is a sequel. Obviously. Unfortunately, that means that it is impossible to look at it without also taking into consideration its predecessor, which for Portal 2 was one of the best designed games ever created. Part of Portal's appeal was the fact that it came out of nowhere. It was a game packed into The Orange Box, almost designed as a tech demo. It was designed for Valve to show off what the Source engine can do. (I may want to write up a bit on the Source engine later). No one was expecting it to be what it was. It didn't even reveal its true story until the last level of the game, but when it did, it was exciting and riveting. Watching the Aperture Science facility peel away was fascinating. Now, Portal 2. Portal 2 starts off with the facility in disarray and you watch it come back together. It's a neat reversal of one of the best parts of the original. Another major theme of Portal was aloneness. You were the only one in this massive, sterile facility, with only the single voice over the intercom to keep you company. Yes, GLaDOS was hilarious in a sarcastic way and had a great personality developed, but she still feels super disconnected from you the player. Everything is white and clean looking. 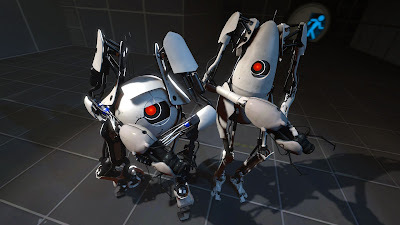 In Portal 2, you are almost always kept company by a physical presence. There is only two sequences where you are by yourself, and they doesn't last very long. A new character is introduced in the form of Wheatley. He is deliberately set up as a really obvious foil for GLaDOS, yet it isn't done in a half-baked way. He is genuinely developed as his own character, with his own quirks and his own traits. Just like the first one, the dialog is extremely well written and very funny. Cave Johnson is the eccentric CEO of Aperture Science, and as the player takes a trip through the history of the company they also take a trip through the mind of Cave Johnson. It's truly fascinating. In terms of setting, Portal is a very claustrophobic game. In Portal 2 on the other hand, there is a point where the world opens up, and you realize: this is not the same game at all. Atlas and P-Body, the co-op characters. The gameplay hasn't changed that much from the original. You get the dual portal device, and it never changes. All of the gameplay changes that they introduce come from the use of gels and different devices that were invented by Aperture. There is a gel that makes surfaces bouncy, a gel that makes you move quickly, and more. There are lasers introduced, and anti-gravity streams, and some other stuff. However, they don't change the fundamental way that you solve the puzzles. It's still all about portal placement. When I first saw the trailers that detailed the different devices and gels that were being introduced, my first thought was that the puzzles would be so much harder than the ones in the original. When I actually played the game though, I was shocked to find that I could solve all the puzzles without too much work. I never once had to look up a solution on the internet, and yet the puzzles weren't simple either. Some of them took quite a bit of thought to solve. Because the coop has twice as many portals at its disposal, the puzzles are actually more complicated than the single player ones. But, with two minds working it out, it doesn't take too long to figure out. There were a couple of times where I got stuck in the coop and took a break. However, when I came back, the puzzles solved quite quickly. Perhaps the best part of Portal 2 is its soundtrack, and just general sound design. The song Still Alive was a highlight of Portal, but in Portal 2 the ending song is just the tip of the iceberg. The number of songs written for the game is large, although I feel like it's no larger than any other game. What they did that was really cool was they released the entire soundtrack for free, in three extensive volumes. Some of the music is exciting, some if it is distracting, and some of it is great for ambient noise when you fall asleep. While driving. At night. In thick, thick fog. The music isn't just good as a stand alone though; it does work well in-game. One of my favourite design features that they implemented was the sound design for the gels. There is always an ambient track playing in the background as you go through the tests. However, when you step on the different gels, the music grows ever so subtly. An extra track or two are added in, on top of the ambience, but also perfectly matching it. The overall effect is that you kind of get the impression that the gels are kind of alive, and characters of their own. Each gel has its own sound, and its own effect, and its own personality. In terms of story, both games are case studies in how to tell a minimalist story. Portal was the story of a hapless test subject trying to survive. Portal 2 is the story of a company, and how it fell apart. Yes, there is the part in the present day, but that is completely overshadowed by the past, and ties in strongly to it as well. However, we are never given any expositions on the history of Aperture Science. 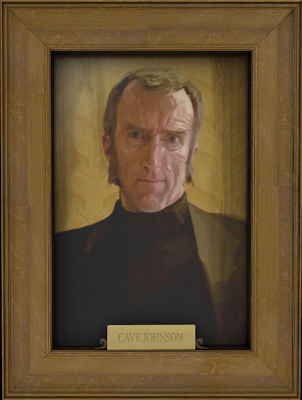 Everything that we learn, we learn based on the environment that we find ourselves in and the humorous commentary by Cave Johnson. We see the company in its glory days, and we watch as it descends into ruin and desperation. It's a fascinating way to tell a story, because they don't spoon feed it to you. You feel smart for figuring it out on your own, even though it isn't hard to see. I can't really think of anything that's super wrong with Portal 2. The story has a climax, and it's exciting, and there is resolution to the story. The ending song is just as good as Still Alive (I actually like it more). My biggest complaint is the frequent loading times, but that's a given with the Source engine. No, this was a brilliant game, and a true gem. I highly recommend it for anyone who likes puzzles, playing cooperatively with friends, or well crafted stories.